Automated patient outreach vendor Relatient wraps up a growth equity round led by Powered Health. For those readers who like to keep count of the industry’s female leaders, the company notes that its bookings have increased by 50 percent since hiring CEO Michele Perry (MPB Strategies) and Director of Customer Success Debbie Crook (Phreesia) within the last year. 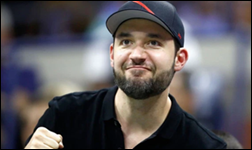 Neither woman, to the best of my knowledge, has attributed that growth to her gender. Saykara raises $5 million from a group of investors led by SpringRock Ventures. The Seattle-based startup has developed app-based virtual assistant software to help physicians with documentation. 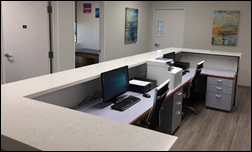 Pilot site and orthopedic practice OrthoIndy (IN) is in the midst of expanding its initial deployment. WeShareMD will open three medical-office-on-demand spaces in California next month, with plans to open two more by the end of the year. Providers can rent the spaces by the day, week, or month. Memberships in the pop-up like business model start at $300 a month, with WeShareMD providing staff, medical equipment, and maintenance, plus any associated overhead costs. An HHS GAO report calls out California’s Medicaid program for its inability to file reports electronically. Program officials say it’s impossible due to the fact that they use 92 different computer systems, though modernization efforts are in the works. In 2016, Medi-Cal officials scrapped much-delayed efforts to bring its IT system up to date after spending $45 million with Xerox. Another attempt is projected to cost $50; meanwhile, state taxpayers are shelling out millions to maintain the 40 year-old patch worked system. AAFP officially gets into the telemedicine game with the launch of virtual consult software for family physicians. The association has partnered with Zipnosis and Surescripts to offer AAFP Virtual Care and e-prescribing to its members as a white-label service. Vibrent Health develops virtual consultation software for dermatologists and referring physicians. Vibrent Health’s technology powers the participant portal of the NIH’s All of Us precision medicine research program. 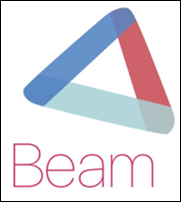 PlushCare founder Sas Ponnapalli launches Beam Health Group, an app-based telemedicine service for small physician practices that includes messaging and billing capabilities. 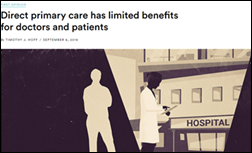 A study in the American Journal of Managed Care finds that Medicare Advantage members who see their primary care providers more often incur 28-percent less in costs and experience 50-percent fewer hospital admissions. Patients in the “high-touch” care group also used preventative medications 41 percent more often, leading the study’s authors to attribute the better outcomes to a combination of improved medication adherence and optimization, and more timely diagnoses and procedures such as vaccinations and screenings. It seems costs could be driven down even further (and patient convenience increased) if virtual consults could replace in-person visits when appropriate. In JAMA, a retrospective study on flu vaccination rates in office settings finds them to be higher earlier in the day, implying physicians suffer from decision fatigue as their days wear on; and in practices that use clinical decision support tools within the EHR to proactively suggest or order vaccines. The authors caution, however, that physicians who rely on such digital tools may wind up trading decision fatigue for alert fatigue. HIE Hixny adds nine counties to its Eastern New York territory. 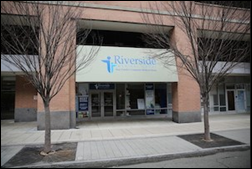 New providers include Dialysis Clinic, Hurley Avenue Family Medicine, Premier Dialysis Center, and family physician Yuk-Wah Chan, MD. The American Heart Association/American Stroke Association names Nordic a “Get with the Guidelines”-compatible vendor. PerfectServe will co-host the Hospital for Special Surgery Educational and Networking Open House September 21 in New York City. Tennessee Oncology, New York Cancer & Blood Specialists, and West Cancer Center (TN) band together to form OneOncology, a New York-based company that aims to offer oncology patients access to providers, treatments, and clinical trials typically unavailable in smaller, community settings. OneOncology will leverage Flatiron Health’s cloud-based EHR, giving the vendor access to de-identified patient data that it can then sell to researchers, drug manufacturers, or clinical trial recruiters. The company has launched with a $200 million investment from General Atlantic, and has named former CVS Health EVP Tracy Bahl president and CEO. 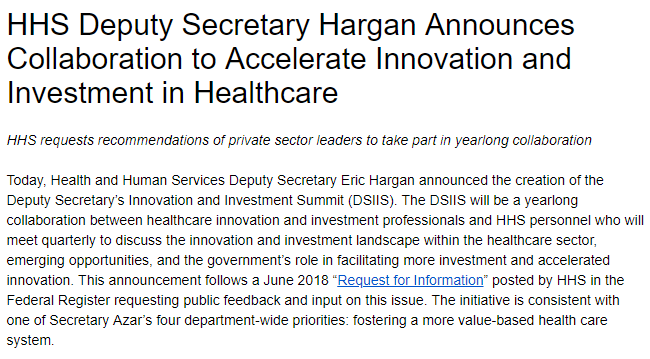 Population health management vendor Evolent Health expands its specialty care management capabilities with the $217-million acquisition of New Century Health, which specializes in tech-enabled cancer and cardiac care management. Envision Medical Group signs on for VillageMD’s practice management services, making it the company’s flagship practice in Michigan. Envision will use VillageMD’s data analytics, physician-based care coordination, and support services across its nine locations in metro Detroit. 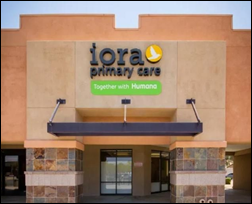 Humana adds 10 more Iora Health primary care practices to its Medicare Advantage plan network in Arizona, Georgia, and Washington. The company’s EHR, Chirp, was developed in-house to offer patients records access, appointment scheduling, and provider messaging. Medical billing company Fellow Health Partners acquires competitor Physicians Management for an undisclosed sum. 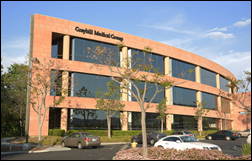 Graybill Medical Group (CA) selects automated dashboard reporting software from Practical Data Solutions. Nevada Governor Brian Sandoval approves $1.2 million to expand HealtHIE Nevada, a statewide HIE that has received the majority of its funding from the federal government. 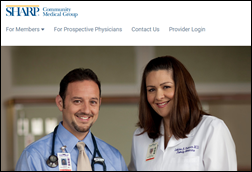 San Diego-based Sharp Community Medical Group offers virtual consults from PlushCare to members of its HMO. 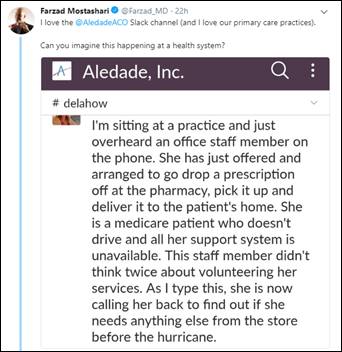 Aledade CEO Farzad Mostashari, MD shares one staff member’s heartwarming attempt to go above and beyond ahead of a major weather event, presumably Hurricane Florence. AdvancedMD will exhibit at the Healthcare Business Management Association Conference September 12-14 in Charlotte, NC. Aprima recaps its ninth annual user conference. University of Texas Medical Branch CEO Donna Sollenberger joins Nordic’s Board of Directors. In keeping with its expansion plans, Chicago-based primary care company Oak Street Health acquires the Medicare business of Philadelphia-based CityLife Neighborhood Clinics. Oak Street, which caters to Medicare patients, plans to hire new staff and roll out its technology platform, which includes Greenway’s EHR and Lightbeam Health’s population health management software, at the newly acquired clinics. The Fostering Hope Initiative in Western Oregon selects healthcare collaboration software from Act.MD. 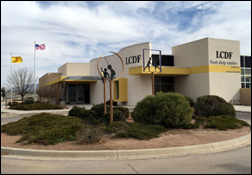 Led by Catholic Community Services, the initiative will enable government, public, and private organizations to work together to improve access to healthcare and social services in underserved neighborhoods. HealthLynked adds group chat capabilities to its membership-based patient-provider digital network. Philadelphia-based mental health technology startup NeuroFlow raises $1.2 million as part of a seed funding rounding led by NJ JumpStart. The company has developed cloud-based software for office-based physicians that combines data from wearables and digital questionnaires with guided meditation, patient messaging, and incentives to improve a patient’s mental health. The very nature of the business model leans towards keeping provider-patient interaction to a minimum so as to maximize profit margins. The cost of a DPC membership contributes to health inequities, catering to more affluent patients and pricing out those who could truly benefit from more direct care. Patients sign up for the bells and whistles, but wind up burdened with having to navigate their DPC and health insurance policies. Promote access to care by providing reimbursement for communications-based technology and telehealth services, including remote patient monitoring. Provide free clinical decision support mechanism software as part of the Appropriate Use Criteria program, which MGMA recommends making voluntary in 2020. Reduce data-reporting obligations by decreasing MIPS reporting requirements and shortening the reporting period. Allow MIPS and APM participants to use 2014 or 2015 Edition Certified EHR Technology in 2019 and 2020. 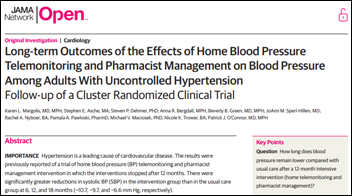 A five-year study of 450 primary care patients with high blood pressure finds that adding telemedicine consults with pharmacists helped to lower their blood pressure more effectively than typical in-office care from their PCP. The effectiveness waned, however, after telemedicine consults ceased a year into the study. Virtual eye exam company Opternative develops a voice-activated vision test, giving patients the ability to obtain new prescriptions using their mobile devices. University of Washington researchers develop an algorithm that can determine the state of a city’s health based on its landscape and infrastructure. 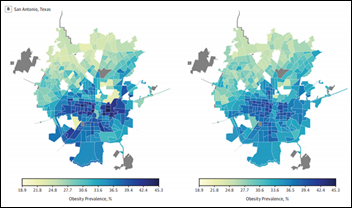 By using satellite and Google Street View images, the software can make correlations between city planning and obesity levels, and influence future public health campaigns. 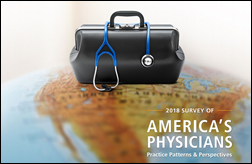 The American Academy of Sleep Medicine issues an RFP for the development and maintenance of a Qualified Clinical Data Registry for sleep medicine physicians and facilities. The company, which also offers on-demand blood-testing services, charges members $150 a month and just hired its first pediatrician in response to customer demand. It raised $10 million earlier this year, funding that Berzin will put towards expanding into new markets. JWM Neurology (IN) implements Encoda’s BackOffice billing technology across its 11 locations. 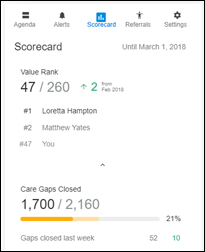 Innovaccer announces GA of InNote, an app that brings relevant clinical data, including referral resources, into a physician’s workflow from within the EHR. 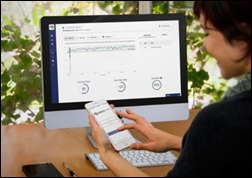 NextGen Healthcare adds electronic prior authorization capabilities from CoverMyMeds to its cloud-based Office EHR (fka MediTouch). 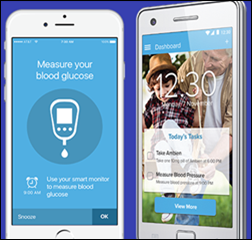 Health IPass offers end users the ability to integrate automated patient messaging from DoctorConnect with its patient payments software. EZReferral develops the EZAnywhere app to help practices better capture referrals from within their website. Vanessa Bentley (North Med Billing Services) joins Medical Practice Consulting Services as billing manager. The company has also expanded its office space in Statesville, NC. Software developer WebRTC Ventures hires Ginger Germani (AgilityFeat) as director of telehealth accounts. Brown & Toland Physicians names Lynn Grennan (Executive Healthcare Consulting) CFO, Therese Crossett (OptumHealth) VP of business development, and Elise Johnson (UnitedHealth) VP of human capital. Aprima will exhibit at the Patient-Centered Medical Home Congress September 14-15 in San Diego. EClinicalWorks will exhibit at CASA 2018 September 5-6 in Huntington Beach, CA.